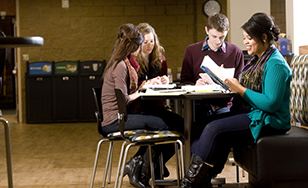 A group of students studying in Storm's Den. The College has once again landed on U.S. News & World Report magazine's list of America's "Best Colleges." St. Scholastica was ranked no. 33 among Best Regional Universities in the Midwest region. Regional universities are classified by U.S. News & World Report as institutions that draw most heavily from surrounding states and provide a full range of undergraduate majors and master's programs, but few doctoral programs. "This recognizes St. Scholastica's institution-wide commitment to success, as illustrated by small class sizes, low student:faculty ratios, and strong graduation and retention rates, all of which figure into the ranking criteria," said Beth Domholdt, Vice President for Academic Affairs. The rankings examined a variety of metrics, including average retention rates, graduation rates and class sizes. Additionally, U.S. News & World Report included St. Scholastica on the "A+ Schools for B Students" in the Midwest and at no. 27 in "Best Colleges for Veterans" in the Midwest. For the "A+ Schools for B Students" list, U.S. News & World Report screened colleges where students' hard work and attitude can make all the difference in the admissions office, even with a GPA in the B-range. To qualify, according to the magazine's methodology, schools had to have an average freshman retention rate of at least 75 percent, and "had to admit a meaningful proportion of applicants whose test scores and class standing put them in non-A territory." Earlier this year, St. Scholastica was named one of Forbes magazine's Top Colleges, and was listed on Money magazine's "Best Colleges" and "Best Private Colleges for Merit Aid" rankings for 2015-16. This year, the College expects to enroll its largest-ever student body of 4,340. That's a 2.4 percent increase over last year. The traditional undergraduate student body will be about 1,840, with graduate, extended and online students numbering about 2,500.